When we, as analog girl and digital boy, first started the Kagyu Monlam blog in 2007, writing about chai wallas and toilets, we did so, hopeful that a day would come when live webcasting would provide a much more direct experience of the Kagyu Monlam Chenmo. Little did we know that not only was Kagyu Monlam webcasting wildly successful, but that the Kagyu Monlam website reports and blogs by other reporters such as Naomi Levine and Goosebumps(4all) on our very own blogsite would enrich that experience. This year, the Kagyu Monlam branched out around the world, covering several continents. We met people who had never been to the Monlam in India but were so happy to be able to attend the International Monlams in Malayasia, Hong Kong, Indonesia, Nepal, Poland and North America. Neither digital boy nor I were able to attend the pan-Asian Monlams nor the Monlam in Poland. But, from the comfort of home (and occasionally at work), I watched parts of the North American Kagyu Monlam by webcast and followed parts of the journey on the delightfully written blog by Lama Kathy Wesley and felt so connected. What an experience to be able to follow this wonderful event. Our hats off to the new media eyes and ears. Thank you for expanding the realm of vision! Standing at the very back on a raised bank you can get a panoramic view of the vast amphitheatre constructed by Lama Chokyi Gyaltsen under the direction of HH Karmapa. Three screens flank each side of a gigantic stage on two levels with a fantasy tree like a delicate Japanese cherry in blossom. As the lights focus on it, the colours change dramatically. (Is this the tree of enlightenment?) 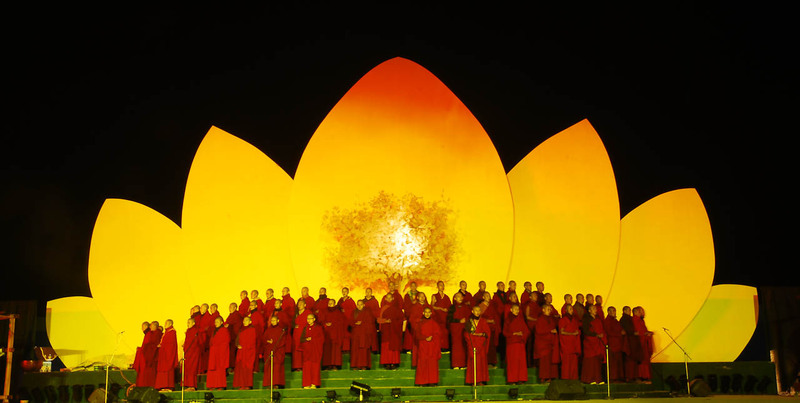 An enormous white seven petal lotus creates a breathtakingly beautiful minimalist background to this most extraordinary production of the life story of Milarepa, directed, produced and written by HH Karmapa, with actors from the Tibetan Institute of Performing Arts in Dharamsala. 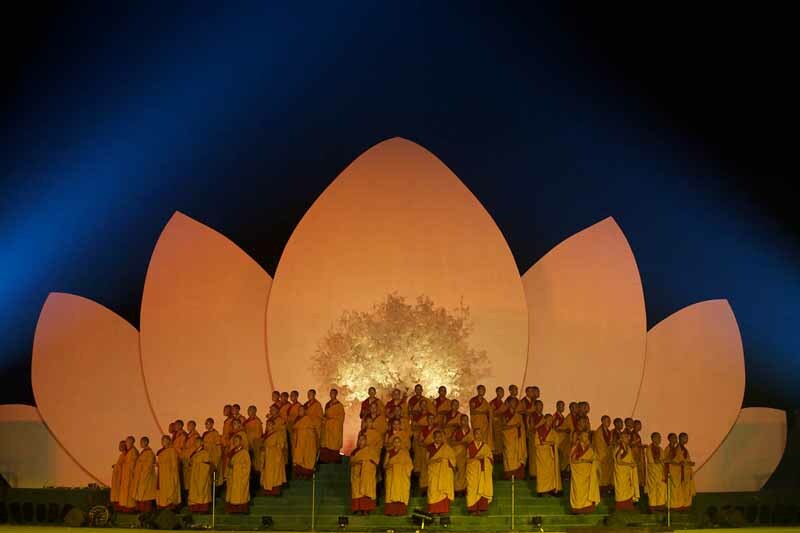 Seated on the stage on either side are five hundred monks and nuns who chant prayers in haunting melodies composed by Karmapa, almost like a Greek chorus, while the screens project pages of the text and impressive views of the icy peaks of the Himalayas where Milarepa meditated. This is both epic spectacle and close up, intimate drama. In his closing remarks at the Monlam, with the entire assembly present, His Holiness Karmapa reminded us of the power of prayers. Several outstanding events occurred this year which indicate to all of us here that His Holiness’ activity has begun in earnest. 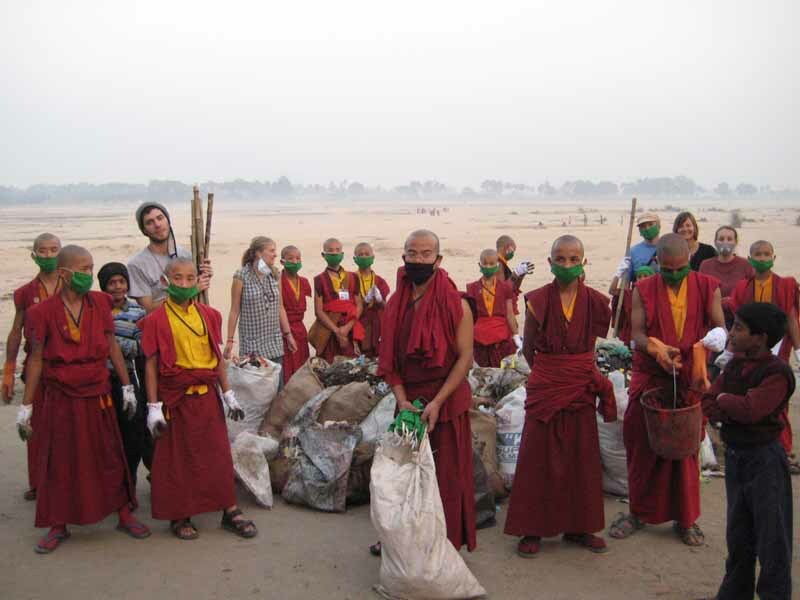 December 29th and 30th were dedicated to cleaning up this most polluted of holy places. Yes, the earth here is sacred but it would be better without the plastic graveyards, the open sewers and the rotting corpses. I actually picked up two dogs lying in the middle of the road, one killed, the other mortally wounded by passing cars. 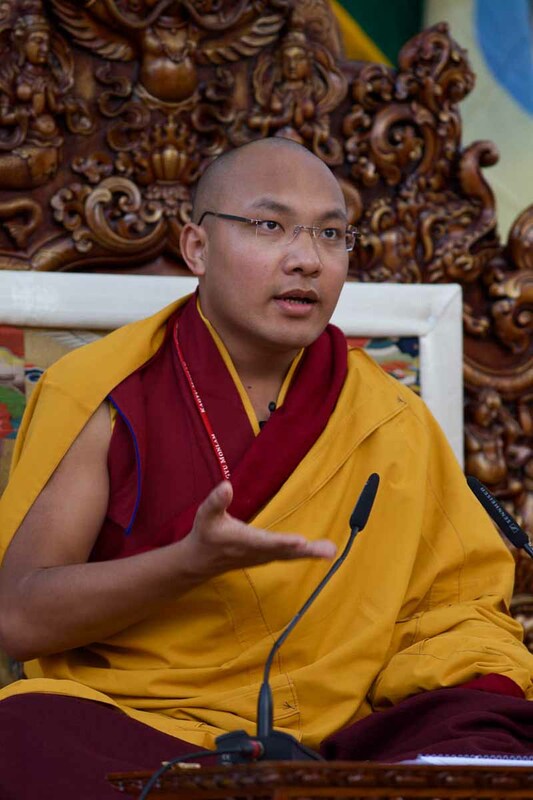 On the concluding few days of the Milarepa sessions, His Holiness Karmapa emphasized that we have to integrate view, meditation and action; they cannot be separated. 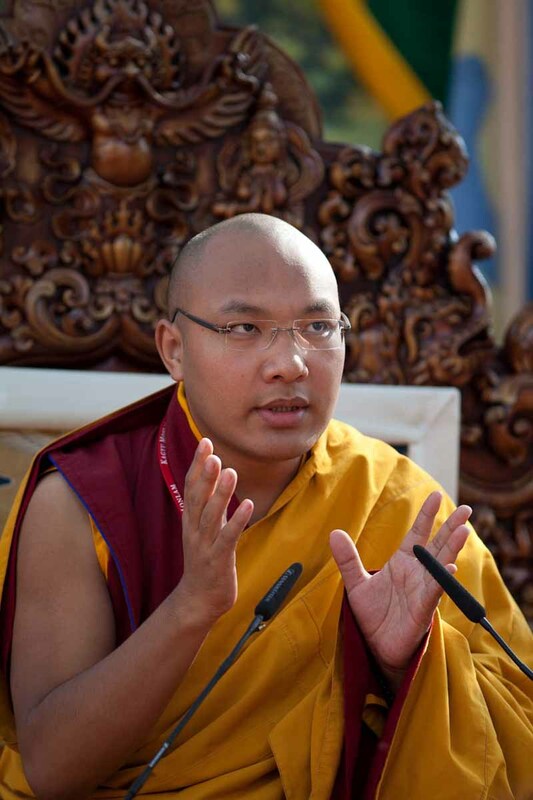 Karmapa was in a jovial mood when he delivered his annual greetings to members of the Kagyu Monlam. ‘Actually’, he said, ‘I am also a member of the Kagyy Monlam. Lama Chodrak brought me a card, but I’m the worst member because I didn’t pay’. He praised Lama Chodrak, the driving force behind the Monlam. ‘The tradition of the Kagyu Monlam’, he continued, ‘began five hundred years ago during the time of the 7th and 8th Karmapas. In India it came into existence through the efforts of Kalu Rinpoche. The Kagyu Monlam has now become international. Many people of all cultures come together and bathe in the prayers.